AFRICANGLOBE – Muslim gunmen have wounded a 14-year-old rights activist who has campaigned for girls’ education in the Swat Valley in north-west Pakistan. 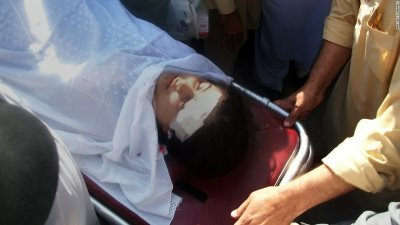 Malala Yousafzai was attacked on her way home from school in Mingora, the region’s main town. She came to public attention in 2009 by writing a diary about life under Taliban militants who had taken control of the valley. A Pakistani Taliban spokesman told reporters they carried out the attack. Ehsanullah Ehsan said that they attacked her because she was anti-Taliban and secular, adding that she would not be spared. Malala Yousafzai was travelling with at least one other girl when she was shot, but there are differing accounts of how events unfolded. One report, citing local sources, says a bearded gunman stopped a car full of schoolgirls, and asked for Malala Yousafzai by name, before opening fire. But a police official also said that unidentified gunmen opened fire on the schoolgirls as they were about to board a van or bus. She was hit in the head and, some reports say, in the neck area by a second bullet, but is now in hospital and is reportedly out of danger. Another girl who was with her at the time was also injured. Malala Yousafzai was just 11 when she was writing her diary, two years after the Taliban took over the Swat Valley, and ordered girls’ schools to close. In the blog, which she authored in Urdu under a pen name, she exposed the suffering caused by the militants as they ruled. She used the pen-name Gul Makai when writing the blog. Her identity only emerged after the Taliban were driven out of Swat and she later won a national award for bravery and was also nominated for an international children’s peace award. Correspondents say she earned the admiration of many across Pakistan for her courage in speaking out about life under the brutal rule of Taliban militants. She has since said that she wants to study law and enter politics when she grows up. “I dreamt of a country where education would prevail,” she said. Malala Yousafzai was a public figure who didn’t shy away from risks and had strong support from her parents for her activism. Indeed, her father, who is a school teacher, expressed his pride in her campaigning. The Taliban, under the notorious militant cleric Maulana Fazlullah, took hold of the Swat Valley in late 2007 and remained in de facto control until they were driven out by Pakistani military forces during an offensive in 2009. While in power they closed girls’ schools, promulgated barbaric Sharia law and introduced measures such as banning the playing of music in cars. Since they were ejected, there have been isolated militant attacks in Swat but the region has largely remained stable and many of the thousands of people who fled during the Taliban years have returned.